In this episode of Inbound Sales Journey, Gray and Ryan discuss the importance of sales scripts in your agency. 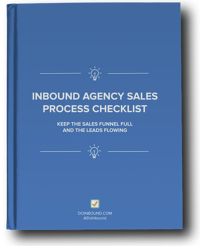 It can be tempting when starting or scaling your agency to rely on sales scripts. However, using sales scripts for yourself or your sales team can actually be causing you more harm, than good. It can be hard to sound natural when you're reading word for word from a script, and the prospect will know. No one wants to buy from a robot! Depending on sales scripts and reading it word for word is an excellent way to lose a deal. However, even if the sales script itself isn't beneficial, the practice of developing and outlining one is useful! Having a framework will make sure you hit all the important notes on your call. You'll have a standard for what a "good" call is. Creating an outline helps you get all the information you need on a shared document in your agency. This can be used to help experienced sales reps refine their calls and also train newbies about what the important points to hit are. Once again, this isn't a word for word script, but an outline. We've even seen it with checkboxes so sales reps can mark off questions they need to have answered as they go. This then allows them to do an assessment on the call afterward and see what they need to improve on in the flow. A good way to improve the quality of your calls is to have all the people who handle sales calls create an outline and script. Then bring everyone together to compare and contrast what they've written. This exercise will help uncover insights from each member that they can share that with the rest of the team. Your experienced sales reps will have fresh ideas and new reps will have proven shortcuts to hit the ground running. Scripting and outlining also helps you develop the mindset of preparation in sales. Too often sales reps can rely on ability but won't reach their full potential because they don't prepare. You want to have a gameplan for objectives, what you will answer in certain situations, and overcoming objections. Sales scripts may not be helpful, but having your team go through the process of creating one can unlock a rush of sales for your agency!